DoubleDutch is a mobile event application used to at conferences or trade shows to help people schedule their day and connect with other attendees. The users needs a way to organize their limited time in a most valuable way. Application that assists event goers schedule time within conferences and connect to other event attendees. At the conferences attendees are encouraged to download and use the app. Screens are customizable to each company’s needs for their conference, trade show, etc. The Session Detail screen is where attendees can view the details of a specific session occurring at the conference. The screen allows users to check in, add the session to their event calendar, view details about the speaker, read and write reviews, and take surveys that the event organizer has posted. Since each conference and trade show is different than others, we have to redesign the session screen convenient and easy to use for every type of conference. We plan to start with user research, identify our competitors, sketch out some conceptual models, mind storming, personas, then actual sketching out of our prototype, and testing it on users. Expected deliverables are wireframes, product pages, prototype of Session Detail page. Audience of the deliverables are Product Management team, and designers. Tools and resources are Google Drive, Docs, Spreadsheet, Iphone, DoubleDutch application, Omnigraffle, Post-­it notes in the development process. After our first meeting with the DoubleDutch team, conducting user research was the first challenge we tackled. To gain a better understanding of what people needed in their conference applications we interviewed 12 people - all of whom had either attended, worked as a vendor, or as a speaker at a conference or trade show. We did not discriminate on conference type because DoubleDutch creates applications for many different types of conferences. From farming equipment to computer science, we knew it was necessary to look for a common theme of need among our interviewees. After an afternoon brainstorming key questions to ask people, we began conducting our user research interviews. Luckily there was an abundance of conference attendees and workers at our fingertips in General Assembly and nearby the SOMA district. Within a day we were able to compile a list of top findings to present to DoubleDutch at our second meeting. Content is not as expected upon entry into Session Detail screen. Speaker face, title synopsis should be located in one place on screen. 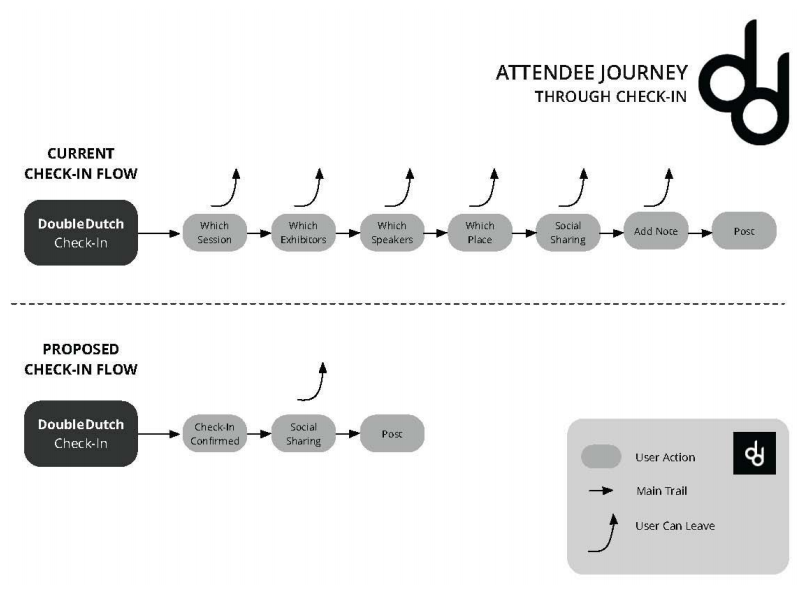 Check-in should be obvious: More linear, easier, tie in network, more value. Agenda, calendar, and schedule confusion. Surveys/reviews should visually appear lower on the screen. View on map is not location. It should contain directions. Networking tools should be obvious and easy for the user. DoubleDutch is the first ever social event app for any conference and event attendee who enjoys networking anda desire to schedule. It showcases attendee networking, mobile agenda creation, surveys & polling and unlike Quickmobile it promotes the ability for the user to network with fellow attendees within the app. We have used Invisionapp prototyping tool for this project. Please visit this link.